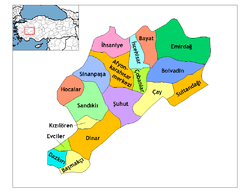 Bayat is a town and district of Afyonkarahisar Province in the Aegean region of Turkey. The mayor is Kadir Üçer (CHP). Bayat is one of a number of towns and villages in Anatolia named after a branch of the Oghuz Turks, who migrated west from the Turkish homelands in Central Asia between 1100 and 1300 AD.